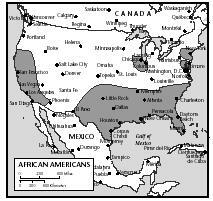 There are African Americans living in all fifty of the United States. The ten states with the largest populations of African Americans are New York, California, Texas, Florida, Georgia, Illinois, North Carolina, Louisiana, Michigan, and Maryland. Although most African Americans live in cities, it is impossible to generalize about how and where they live. African American families, like European American families, make their homes in every type of community—urban, suburban, and rural. In the 1600s, African slaves were brought to the United States, along with their food and styles of cooking. They brought okra, sesame seeds, peanuts, black-eyed peas, and rice. Using these foods, they introduced new recipes to the existing American dishes. The slaves were also given only a small portion of food each week, so they learned to make dishes with the foods they had, such as pork, cornmeal, and vegetables. Several of these dishes such as cornbread and grits, which are dried and boiled grains from corn, are still made as of the twenty-first century. 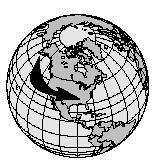 African Americans also continue to use molasses as a sweetener in their dishes and in drinks, such as iced tea. Beginning in the 1960s, interest in African American culture and heritage has grown. Many African Americans celebrate the cultural holiday Kwanzaa, don colorful dress reflecting their African heritage, and promote a unique ethnic style of cooking, sometimes called "soul food." During the 1960s and 1970s African American business people established "soul food" restaurants all over the country, where Americans of all ethnic origins could enjoy spicy barbecued meats and poultry, tasty greens, cornbread, and other home-style dishes. Rinse collard greens under running water to remove all grit. Lay 3 or 4 collard green leaves on top of each other, roll them up, and then cut the roll into 1-inch slices. Cook on medium heat until the bacon is crispy. Do not drain the bacon grease. Add the water to the stock pot and bring to a boil. Add one-half of the chopped onion, the ham hock, and the salt and pepper. Let mixture boil for about 1 hour to thoroughly cook the ham hock. Add the chopped collard greens and the remaining half of the chopped onion. If there are too many greens to fit into the pot, add them in batches. As the greens wilt, add more. Simmer for about 30 minutes, stirring frequently to distribute the ham flavors. Serve with chopped green onions and hot sauce, if desired. Fish has always been an important staple in the African American diet. Fried catfish finds its way to the table often, served with such standard side dishes as greens, macaroni and cheese, and hush puppies. Hush puppies are derived from cornbread. It is said that hush puppies originated during the Civil War (1861–1865) when soldiers would throw fried cornbread to their dogs—to "hush the puppies." Combine corn meal, baking powder, flour, and salt, and stir to combine. Make a well in the center. Add eggs and milk to make a stiff dough. Shape dough into 1-inch balls and drop into hot oil. Fry until golden brown. Mix water, molasses, and lemon juice together in a pitcher, stirring well to make sure molasses is thoroughly mixed in. Refrigerate for at least 2 hours, or until well chilled. When ready to serve, press the mint against the side of another pitcher with the back of a spoon. Then add ice and pour in the molasses water. 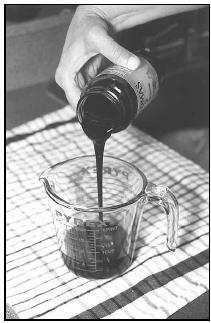 Molasses Water combines thick, sweet molasses, shown here being poured into a measuring cup, with lemon juice and water. Molasses Water is similar to lemonade, sweetened with the distinctive molasses flavor. traditions, as well as sweetening dishes and drinks with molasses. Other traditional African American foods and dishes include barbecued meat, sweet cornbread, fried chicken, and of course, desserts. A delicacy that has been a specialty of African Americans especially in the South is chitterlings (nicknamed "chitlins") made from pig stomach and intestines that have been boiled and then deep-fried. The states with the largest populations of African Americans are New York, California, Texas, Florida, Georgia, Illinois, North Carolina, Louisiana, Michigan, and Maryland. Wash and scrub sweet potatoes. Place them in a large saucepan and add water to cover them. Boil them in their skin until easily pierced with a fork (about 20 minutes). Allow potatoes to cool slightly. Peel and mash until smooth. Add butter, sugar, flour, milk, eggs, and nutmeg. Mix well. Add lemon extract and stir until smooth. Put ingredients in pie shell and bake for 30 minutes. Hoppin' John, a popular dish of rice and black-eyed peas, is traditionally eaten on New Year's Day to bring good luck throughout the rest of the year. Red beans and rice is another traditional dish, especially in the southern states. Wash beans in cold water. Drain and put in covered pot with the cold water. Add ham or sausage to pot. Heat to boiling. Add chopped onions, garlic, green pepper, bay leaf, and salt and pepper. Lower heat. Simmer for 2 hours, stirring occasionally until beans are soft. Mash some of the beans against side of the pot to make a creamy sauce. In the early 1900s, African Americans began to eat more dairy foods, such as eggs, milk, and butter. They also planted wheat and corn and grew different kinds of fruits and vegetables. With these ingredients, they began to prepare new dishes, most of which are still eaten. In the southern U.S. regions, African cooking became a part of everyday meals. In New Orleans, Creole cooking developed from a mix of African, French, English, and Spanish cooking. Creole dishes such as jambalaya and gumbo contained chicken or seafood and were mixed with African foods such as rice, okra, or red peppers. These dishes are still popular. African Americans enjoy inviting family and friends over to visit during the holidays. With busy schedules like families everywhere, African Americans often plan family visits months in advance. Many African Americans hold annual family reunions, often on July 4, Independence Day. Relatives come from all over the United States, often meeting at a different family's home each year. Large, extended families may even hold their reunions at a park where large picnic areas can accommodate the dozens of families in attendance. Preparations begin one or two days before July 4. Barbecued meat, especially chicken and pork spareribs, is the main dish. Individual families contribute a variety of homemade pies and cakes; sweetened iced tea and lemonade are favorite beverages. Side dishes include potato salad, greens, yams, or candied sweet potatoes, and homemade butter pound cake. Wash the potatoes and place them in a heavy saucepan with enough water to cover them. Bring to a boil over high heat. Lower heat and cook potatoes until tender, about 20 minutes. Drain potatoes and allow to cool. Peel and cut potatoes into ½-inch pieces. Place the chopped celery, potatoes, and onions in a large bowl. Add salt and pepper. Stir gently to combine. Cover with plastic wrap and refrigerate overnight. Serve chilled. For breakfast on Christmas Day, African Americans often eat grits, eggs, sausage or ham, and freshly baked biscuits with butter and syrup. For Christmas dinner a baked ham, baked chicken with cornbread stuffing, green vegetables, cornbread, candied yams, rice, and baked macaroni and cheese are staples. Apple pie and fruitcake are traditionally served for dessert. Place the water and Tablespoon of salt in heavy saucepan and bring to a boil. Slowly stir in the macaroni. Boil for 12 minutes, stirring continuously. Macaroni is done when firm, but tender. Strain the macaroni and rinse with a little cold water. Mix the macaroni with the butter and set aside. In a small bowl, beat the eggs until light yellow. Add milk and teaspoon of salt. In a large buttered casserole dish, put a layer of the macaroni, then add a layer of cheese. Continue to do this, ending with a cheese layer on top. Pour the egg mixture slowly and evenly over the top. Bake for 30 to 40 minutes, until the top is bubbly and golden brown. Many African Americans celebrate Kwanzaa, a non-religious cultural holiday, from December 26 through January 1. During the seven days of Kwanzaa (which is derived from a Swahili word for "first fruits of the harvest"), African Americans celebrate their heritage and take pride in their African traditions. The Kwanzaa celebration was originated by Dr. Maulana Karenga, an activist and scholar, who has been involved in the development of Black Studies and African American art and student movements in the United States. Each of the seven days of Kwanzaa represents a different principle, such as unity, purpose, and creativity. African American families celebrate this community–building holiday in their own way, with music, gettogethers, and feasting. Grease 13x9x2-inch round pizza pan. Combine butter, sugar, and vanilla in large bowl. Add eggs and beat with spoon. Gradually stir into egg mixture until blended. Stir in pecans (if using them). Bake about 20 minutes, or until top springs back when touched lightly in center. Prepare chocolate cream by beating all ingredients in a bowl until smooth. Spread chocolate cream over top of brownies. Place fruit on each slice before serving. It is tradition for African Americans to eat a lot of food for breakfast. They may eat chicken, waffles, grits (dried and boiled grains from corn), ham, corn fritters, and bacon. Traditionally in the South, a Sunday breakfast includes fried apples, grits, and pork sausage. Salad, including leftover salad, may also be eaten as a breakfast dish. Bologna is a popular luncheon meat for many African Americans. It is sometimes eaten at breakfast instead of bacon, and it is eaten in sandwiches for lunch. Many African Americans enjoy inviting family and friends home for a barbecue or a fish fry. Popular snacks are roasted peanuts, pecans, and limbo cakes (deep-fried plantains, or bananas). Soft drinks, iced tea, and lemonade are popular beverages. Fried Apples are made from thinly sliced apples. To prepare an apple for slicing, first cut it in half, and then into quarters. Cut away the core and seeds, and then cut each quarter into thin slices. Core the apples and slice them, leaving the skin on. When oil is hot, add the apples and water. Cook until the apples are soft, about 10 minutes. Sprinkle them with mixture of sugar and cinnamon, and serve warm. Place tomatoes, cucumber, and onions in a large salad bowl. In a separate bowl, mix together the remaining ingredients to make a dressing. Peel casing (thin outer skin) off bologna and make a small cut from the outside to the center of each piece so slices do not puff up too much. Place bologna slices in skillet and cook, turning once, until they are lightly browned. Many African Americans prepare their food by frying it, barbecuing, and serving dishes with gravy and sauces. It is also common to bake cakes and pies from "scratch" (not from a commercial mix). These traditions have been passed down through many generations. Contemporary African Americans, like many Americans of all ethnicities, have become more health conscious, and have added more nutritional foods, such as fruits and vegetables, to their daily diets. Many African Americans have changed to healthier, lighter cooking styles for everyday cooking, reserving the traditional dishes (many of which are higher in fat) for holidays and special occasions. According to estimates in 2000 there were 8.7 million African American families in the United States, about 44 percent of which were headed by single women. African American couples tend to have larger families—just over 20 percent of African American married couple families have five or more members, compared to 12 percent of white (not of Hispanic origin) married-couple families. About half of all African American married-couple families had incomes of $50,000 or more (compared to 60 percent of white married-couple families). In 1999 about 24 percent of African Americans were living in poverty, an all-time record low in the United States. According to the U.S. Department of Agriculture (USDA) Center for Nutrition Policy and Promotion's Healthy Eating Index, most Americans eat a diet that needs improvement. Only five percent of African Americans (compared to 11 percent of whites) have a diet categorized as "good" (based on ten measures including total consumption of fat, cholesterol, and sodium), and 28 percent of African Americans (compared to 16 percent of whites) have a diet categorized as "poor." Broussard, Antoinette. African-American Holiday Traditions: Celebrating with Passion, Style, and Grace . New York: Citadel Press, 2000. Copage, Eric V. Kwanzaa: An African-American Celebration of Culture and Cooking . New York: William Morrow and Company, Inc., 1991. Harris, Jessica B. A Kwanzaa Keepsake: celebrating the holiday with new traditions and feasts . New York: Simon & Schuster, 1995. Harris, Jessica B. The Welcome Table: African-American Heritage Cooking . New York: Fireside, 1995. Mack-Williams, Kibibi. Food and Our History . Vero Beach, FL: Rourke Press, Inc., 1995. Medearis, Angela Shelf. The African-American Kitchen: Cooking from our Heritage . New York: Penguin Group, 1994. The Chitterling Site. [Online] Available http://www.chitterlings.com (accessed August 24, 2001). The Holiday Spot. [Online] Available http://www.theholidayspot.com/kwanzaa/kwanzaa_recipes.htm (accessed April 10, 2001). Kwanzaa for Kids. [Online] Available http://kwanzaa4kids.homestead.com/kwanzaabrownies~main.html (accessed April 18, 2001). Mim's Cyber Kitchen Presents Kwanzaa. [Online] Available http://www.cyber-kitchen.com/holidays/kwanzaa/recipes.htm (accessed August 24, 2001). Morris, DeNita S.B. "From Fish Fry to Stir Fry: The African American Eating Experience. [Online] Available http://www.bet.com/FOOD/0,1821,C-9-68-188214,00.html (accessed July 23, 2001). I have spoken with many of my older family members that are 60 plus. My older family members don't know any thing about fried apples,fried chitterlings, the mixing of two types of pork in one dish such as ham hock and bacon it would always be one or no meat or molasses water. Nor did they add lard or bacon grease to their hush puppy mix and then fray it but did use lard until they learned better. Frying would take place on Sunday for Sunday dinner only. Back in the day African American had alot of kids i am in my 40's I have a family size of 4 and my mother came from a family of 6. My mother had 4 children with our father, her oldest sister had 1 with her husband, her younger sister had 1 with her busband, and her brother had 3 with his wife. My fathers, father raised 6 children on his own 4 males and 2 females after his wife was killed. My sister have 3 children with her husband and 1 adopted chils, my younger brother have 2 with his with and my older brother have 1 with his first wife and 2 with his second wife need to up date info. Your history of African American cuisine is well intentioned but not correct. Yes, the slaves were poor and had to make due with the simplest and least rich food. The people in the old south who did eat well, however, were the rich plantation owners and they didn't do any of their own cooking. The cooks at the plantations were all black women who cooked with the best ingredients and developed all the dishes popular down there. These black women developed the rich cuisine of the American south. The resulting dishes, developed by the slave cooks, were widely eaten by black Americans (and rich whites who continued to employ black cooks) after slavery was over and black people had access to better foods. Sounds like a some stereotypical prick wrote this blog. You have no clue regarding African-American cuisine choices and the history behind them.